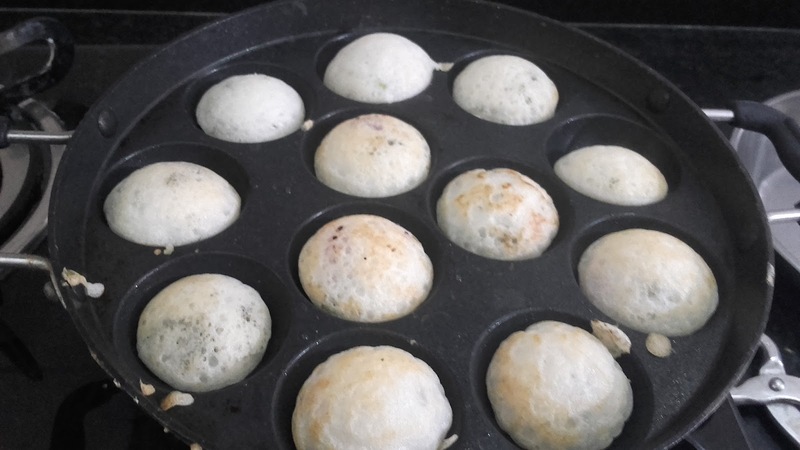 Appam /paniyaram / Appe are very popular south Indian snacks and many versions of recipes are used for making it. For making Appam special pan is required and it can be sweet or savory.My kids enjoy eating apples and I make it often with different ingredients.I always refer savory version as I can add vegetables to it.I often make Appam using grated vegetables like carrot, radish, beetroot and cabbage as a nutritious ingredients. I have already posted the recipe for instant Appam , which needs no fermentation and can be made in few minutes. Following is a savoury Appam recipe using onions and coriander. I have used the fermented batter of rice and urad dal(Same as that of idly/dosa batter) for making appe. Try this recipe and let me know your feedbacks in comments. Wash and soak dal and rice in water separately for 8 hours. After 8 hours grind rice and dal with little water separately in the grinder. Mix ground rice and dal and add some water and salt in it. Keep this batter side for 8-10 hours for fermentation. Add finely chopped onions, chilies, coriander leaves in the batter and mix well. Add salt, cumin power, and water as per required consistency in the batter. For making Appam heat and grease the pan. Pour a spoon full of the batter in Appam pan and cover pan with a lid. Cook Appam on low flame for 5 minutes and turn on another side. Roast appe on both sides. Serve Appam with any chutney of choice.